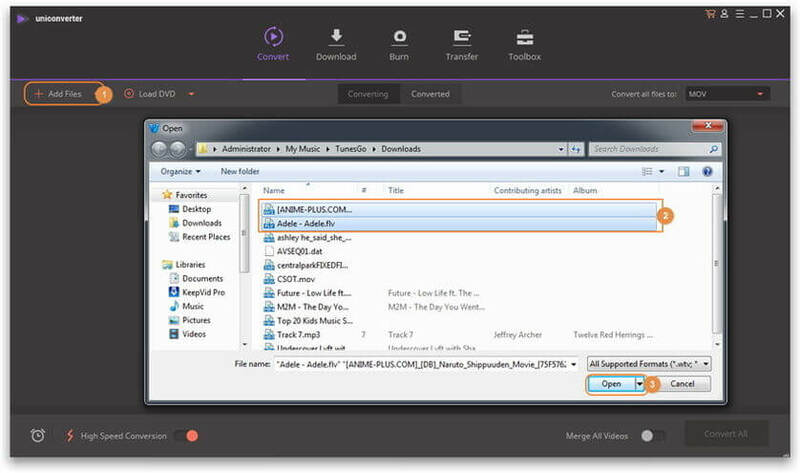 AC3 audiotracks can be contained in different format containers, such as MP4, and MKV, etc. Videos with AC3 audio can't be played in QuickTime, iTunes, as well as iPhone, iPad, Apple TV, etc. But these media players can decode AAC tracks. That's why many people want to convert the audio of an MKV (or MP4, etc) from AC3 to AAC. If you also need to convert AC3 to AAC, a powerful and professional tool can help you do this job quickly and easily. Wondershare UniConverter (originally Wondershare Video Converter Ultimate) is specially designed to convert any popular video and audio files. 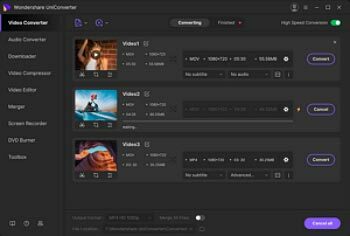 You can not only change your video & audio files from one format container to another, but also easily change the audio track of your video files to other audio tracks. That's to say, you can use this great program to convert AC3 audio files to AAC audio files, as well as convert AC3 audio track to AAC audio track while keeping the video format or changing the video format. The following guide will show you how to convert AC3 to AAC audio codec with Wondershare UniConverter (originally Wondershare Video Converter Ultimate), and the steps below are very easy to follow. Check it out. First of all, find the videos files that contains AC3 audio tracks on your PC, and then directly drag the files you want from the computer to the main interface of this program. Of course, there is another way you can use to import your video files. Just simply click the Add Files button in the program's window. If you want to import the audio file into the program, just follow the same step. If you have imported a video file, then you don't have to change the video format. All you need to do is clicking the down arrow icon in the Target section, and then click Audio tab in the top, select AAC from the left sidebar and specific audio quality in the right. Click the Convert button at the lower-right bottom of the software window to start converting AC3 to AAC audio codec. Immediately, you can see the purple conversion progress bar, and the program will finish the conversion in a short time. After that, you can switch to Converted tab to locate the converted audio file in your computer. Advanced Audio Coding (AAC) is a common standard for audio coding for lossy digital audio. It is a successor to the MP3 format, offers better sound quality as compared to MP3 and is authorized by the ISO and IEC. AC3 is a commonly used file extension for the audio files played on DVDs. The AC3 is a common format for Dolby Digital audio on Blue-Ray and DVD. What is AC3/AAC AC3 (Audio Coding) is nothing but Dolby Digital audio codec and the compression for this is lossy as well, except for the Dolby TrueHD. It is the common version which contains up to six channels of audio. History AAC was developed as a joint project by Dolby Laboratories, Sony Corporation, AAC, Nokia, AT&T Laboratories and Fraunhofer IIS as an international standard, as a product of the Moving Picture Experts Group. The development took place in the year 1997. AC3 was originally known to be Dolby Stereo Digital until the year 1994. Dolby Laboratories in early 1997 changed the name from “Dolby AC-3 surround sound" to "Dolby Surround Digital" which is nothing but the current format of Dolby Digital. Compatibility AAC is the widely used format for iPhone, iPod, iPad, Nintendo DSi, YouTube, DivX Plus Web Player and PS3, which are all commonly used devices. It is also compatible with Nokia, Android, Blackberry and webOS operating devices, and also the major brands of audio systems in the cars. AC3, widely known as Dolby Digital is used in DVDs, Blue-Ray Disks, game consoles and HDTV broadcast standard format. Quality AAC compresses files to a smaller size so that the files occupy less space and maintain sound quality at the same time. AAC produces the frequency between 8 to 96 KHz, while AC3 gives out a bit rate of 384 KBPS. If you want to play audios on amplifier system, you should use files in AC3 track for the better effect. Talking in terms of quality, AAC is more advanced when it comes to the advanced lossy format. It produces better quality audio as compared to AC3, even with the same bitrate, and a better quality with low bitrates. In situations when you want to have better compatibility on older Dolby Digital devices, you should go for the AC3 format. Supports different sampling rates, multichannel and bit depths. The industry standard for DTV and DVD media. Provides only full range channels. Sounds better in other formats in quality aspects. Comes in different object types. Maximum support-5.1 channel audio CDs. 448 kbps is the maximum limit for Digital Dolby.